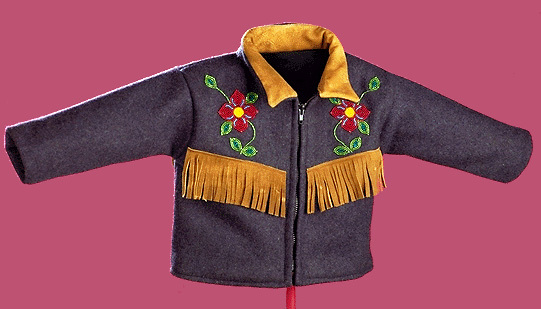 Clothing has always been an important and distinctive part of the culture of the Dene. Who are the Dene? The name means simply "people" and refers to Aboriginal people whose homeland is the western part of Canada's Northwest Territories. The Dene speak a number of different Northern Athapaskan languages: Gwich'in, North Slavey, South Slavey, Dogrib and Chipewyan. The Dene derived pride and satisfaction from owning and wearing fine clothing. Dressing well revealed good physical and emotional health, self-confidence, and economic success. The care and attention a woman gave to making garments for her husband and children expressed love, concern for their well-being and pride in their achievements. Garments made from imported textiles and styled after European prototypes became increasingly popular in the late nineteenth century. 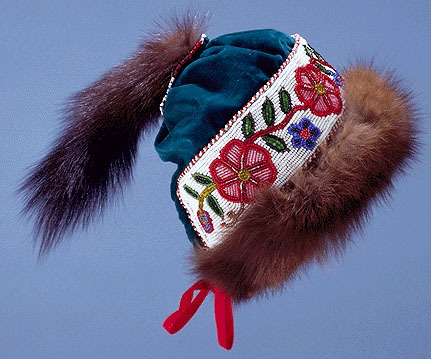 Ready-to-wear articles of clothing were available, but were expensive and beyond the means of most Dene. 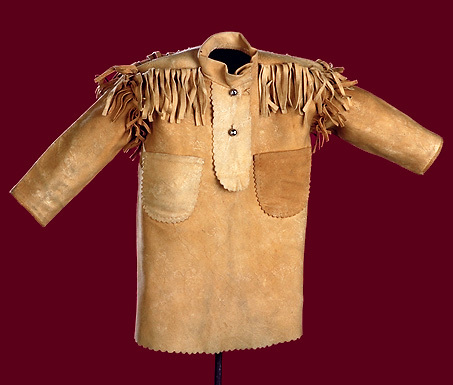 In general, Euro-Canadian clothing styles were replicated in more readily available, cheaper, smoked hide; or dry goods such as stroud, velvet, and tartan cloth were purchased and clothing sewn up at home. Formerly, all Dene women knew how to prepare animal hides and to sew and decorate clothing. Relatively few women today carry on these traditions. Most Dene, most of the time, dress in clothing very like that worn in rural areas elsewhere in Canada. 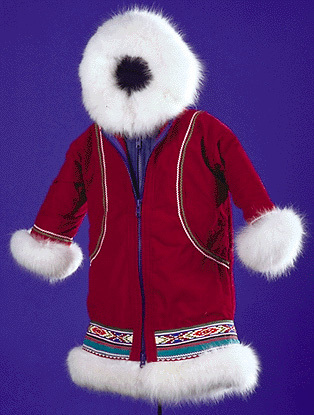 Nevertheless, a woman's ability to sew continues to be valued in Dene society, and garments distinctive in materials and styling continue to be made and worn. The decoration of clothing provides an important outlet for artistic expression. "I did a lot of sewing all my life, that's what I'm good at. The only time I didn't sew is when I was raising my eight children or when I'm sleeping. To this day I still sew. I did all the sewing for my family." Rose Tsetso, Fort Simpson, Northwest Territories, 1991. "My grandmother taught me to tan moosehide and to make snowshoes. 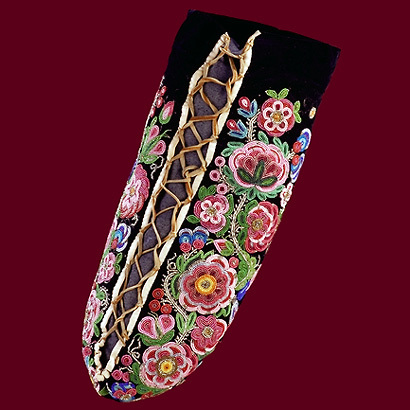 My mother taught me to do fancy work with quills and silk, at age 10 or 12. She showed me how to make moccasins, mittens and slippers. I did all the foot and hand-wear for my grandparents after they got too old." Jane Grossetete, Fort Simpson, Northwest Territories, 1991. "The young people should be shown the traditions of sewing. I was raised by my grandparents, and when I was eight or nine, my grandmother told me that I could make a good living from what I sew. I am really attached to my sewing and have been busy with needles and thread since I was thirteen. I think about the old times when I sew and I wonder who is going to do this when I am gone..."
Stella Mendo, Fort Norman, Northwest Territories, 1991.